Looks like where I crossed a few years ago when it was flooded in. It was harrowing to me, with a laptop..
On our way home from town Monday, I went across on my hands and knees --- it was a lot trickier than the other log we used to have. But Mark somehow navigated it today with a couple of big bags of chicken waterers! I was highly impressed. My Grandpa was recently telling me about a small spring feed stream that was unpredictable. They could have a 1 inch ran and the stream would just trickle or no rain for 2 weeks and it would be 2 feet deep. 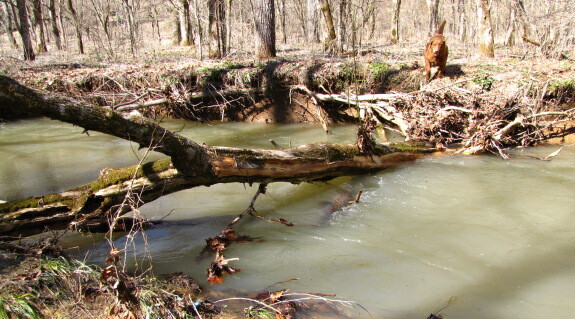 He and his brother had to cross this creek to get to school or detour around the spring. So they made stilts, so they could cross during high water without getting their "trousers" or shoes wet. So maybe you just need some stilts and good balance. That's an outside the box solution I haven't heard yet! Great anecdote.